JustNick – tagged "12 Days of Giveaways"
Nathalie back with you today. I hope you all have been visiting the JustNick Studio blog and collecting all the awesome designs that Nicole has created. Today's free cut file, HOLIDAY LAURELS, is one of my favorites of the past 12 days! Love the designs, and their versatility, so i put them to work on a layout all about my beautiful mami. It is no secrets, i love florals, so i decided to use the floral image of the Holiday Laurel cut file to create the cut out on my page. However, they were not placed as in the original image; instead i chose to layer them so that they create a cascading movement on the page. I used Crate Paper's Merry Days collection to back the flowers and leaves in the cut out, and then attach them to one of the collection's paper using foam adhesive. I used the spaces created by the movement of the cut outs to add the picture of my mami -on a very recent shopping trip- and my journal lines. A few embellishments is all that was needed to complement the picture. To complete the page, first i added another cut out -created using the same cut file- at the end of the floral cut out so that it will elongate the floral movement. The space below this was used to add the title, which was created using the Merry Wishes cut file, a bit of Vicki Boutin gold glaze makes it stand out on this page. Love how this turned out, and now it is time for you to stop by the JustNick Store to pick up a free copy of the HOLIDAY LAURELS cut file. Enter the code: LAURELFREE at checkout to get this design for free. This code is only valid until midnight CST on December 11, 2018. Cannot wait to see what you create with this cut file! Welcome back to the JustNick Studios blog for the 12 Days of Giveaways! Majken here with you today to share the FREE cut file for Day 10. How pretty is this file?! It's very versatile, too. I immediately knew I wanted to create my layout title with it, but I also ended up using a couple of the other cut files for accents and a subtitle. As with many families during the holidays, one of our traditions is going to find a fresh-cut tree and bringing it home. Then we put on lights and a garland before adding the ornaments. This photo was taken after the first stage of decorating. After cutting the title, I also traced around the edges so I could cut the red cardstock to back my title letters. I also cut out the mistletoe leaves to include around around my letters. I love the "Merry & Bright" phrase, and I used it to balance the bottom of my layout. To frame my photo, I also weaved some varied strips of patterned paper and sewed a few for extra texture. Some ephemera, stickers, and enamel dots helped complete my layout. Now for the fun part so you can use this cut file yourself! Enter the code: GOODFREE at checkout to get this design for free. This code is only valid until midnight CST on December 10, 2018. No purchase necessary. Coupon code must be entered to receive this item for free. No refunds will be given. The design will still be available in the JustNick Store for purchase after the discount code expires. So glad you stopped by today! And don't forget to come back tomorrow for another free cut file for the 12 Days of Giveaways. I cut the snowflake from the "Daily Details" sheet, a sheet full of different colored snowflakes and love how it turned out. I love background cut files and often use a "normal sized" cut file and enlarge it so I can use it for my background, like I did here. If you like the "snowflakes 5" cut file too, then be sure to hop over to the JustNick shop to grab this free cut file!! Enter the code: SNOW5FREE at checkout to get this design for free. This code is only valid until midnight CST on December 7, 2018. WIshing you a wonderful day and happy crafting! It is starting to feel and look a lot like Christmas, and what better way to celebrate the beginning of the season than to share cut files! For the next 12 days, JustNick Studio will be giving a cut file a day for free! So, let's get started! Every few years we change the color of the Christmas tree decorations, and this year our daughter decided the colors: blush, white and blue-gray. The new colors mean that our Christmas decorations also have to be revamped a bit, so i decided to create this piece to for our home. I pulled a Jillibean embroidery hoop and painted to match our wood pieces. While the paint dried, i used today's free cut file, "Build a Poinsetta" to cut the pieces for the flowers from papers that matched the tones of the tree ornaments. A bit of Vicki Boutin Art Crayon helps to add the shading to the petals, while a bone folder helped to create the movement of the flowers and leaves. To finish each flower, I added a few french knots to the center of each flower. To add the sentiment to the hoop, i decided to pull the Merry and Bright cut file and used only the "merry" word of it to create the stitched sentiment on the hoop. To assemble the piece, i added some small branches created using a soon-to-be-released "Holiday Boughs" cut file, and then glued all the pieces to the hoop. I added a piece of ribbon to the top of the hoop, so that the piece can also be hung from the tree or around our home. Just love how this turned out!!! Enter the code: POINTFREE at checkout to get this design for free. This code is only valid until midnight CST on December 01, 2018. I cannot wait to see what you create with this cut file! As always please do not hesitate to contact me if you have questions on how this was put together. Happy Monday scrappers! Nicole here with a fun summer layout... I don't know about you, but it's been a crazy winter in Maryland! Last month, when I created this layout, it was in the 60's all weekend. On the 20th of February! Naturally, I was in the mood to scrap a summer layout. LOL. I used three different cut files and Simple Stories' You are here collection for this layout (Arrows 3, Summer Words, Sunny Days). I also used some of my Altenew stamps to create a fun geometric flower and a smaller flower to add to the "relax" die cut circle. Here are a few closer photos of my layout. I love all the layering on this layout! Products Used: Patterned Paper, Stickers: Chipboard Frame: Enamel Dots, Clear Stickers: Die-cuts: Simple Stories, Stamps: Altenew, Digital Cutfiles: Just Nick Studio (Arrow 3, Summer Words, Sunny Days). Welcome to the 12th day of Christmas on the Just Nick blog. 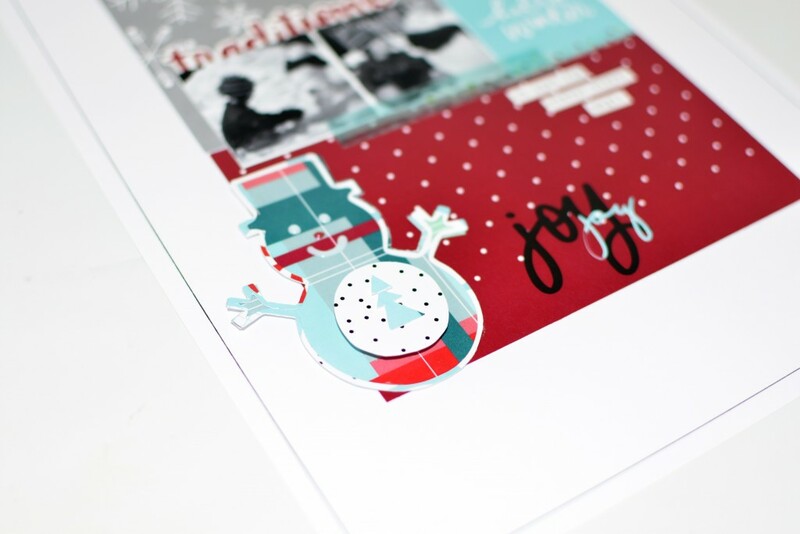 Today, I am showcasing the fun Holiday Tags cut file. I knew that I wanted to make the holiday tags quite big and I liked the idea of having large 'Baubles' made out of the round tags on my layout to match the 3 photos of my kids. The word JOY is featured in my Christmas photo shoot this year which highlights the Joy in the holiday tag as well. I quite like adding some extra embellishments on my page which mirror the cut outs in the cut file - so extra christmas trees and stars and I also used the small cut out of the tree on my layout as well. I decided to cut out the holiday tags in white to tie the cut file with with the JOY in my photos and I love the crisp white on white look as well. I then added colour by adding patterned paper under the negative space in the cut file and also with embellishments on my page. Did you know that each month, store owner Nicole Nowosad creates FREE cut files for the Scrapbook and Cards Today magazine blog? To help celebrate our last day of our 12 days of giveaways, they have offered up a FREE winter issue to one of our readers! Just leave a comment here on the blog, or on our Instagram feed (@justnickstudio) for your chance to win a free copy of this great magazine! We will draw a winner tomorrow on December 13, 2016 ! Hey everyone it's Cathy and I'm getting in on the freebie fun! For my layout today I'm using the free Pine Needle Bough cut file available in the shop! If you want to get yourself this cute little file make sure you use the code BOUGHFREE. It's only free for today though, so make sure you pop over to the shop asap. I loved this cut file and when I saw it I immediately thought of it as making a cute accent to add to a wreath, so I grabbed another JustNick cut file that I had on my computer and cut out a wreath. I then cut out my bough and sprayed it with black Heidi Swapp colour shine. I love how bold and fun it looks on my layout and the added pompoms just make it even that much more fun! Today’s design – Pineneedle Bough - is yours for FREE today only! Just enter code: BOUGHFREE at checkout to get this design for free. This code is only valid until midnight CST on December 11th, 2016. The design will still be available in the JustNick Store for purchase after the discount code expires. Thanks so much for stopping by today. Have the Happiest of Holidays!! Hello everyone. Are you getting ready for the holidays? All done shopping? Ready to scrap those holiday/snow pictures? 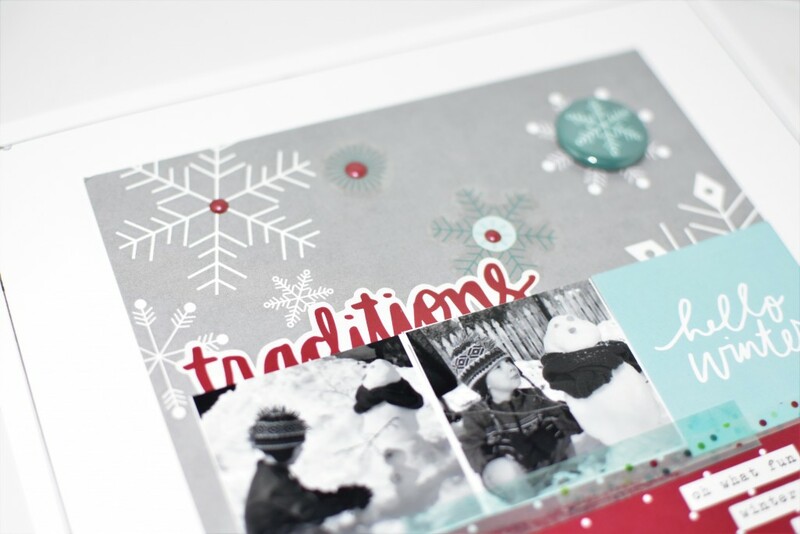 If so, I have a fun layout to share with you using Pretty Little Studio's Holly Jolly collection. I really like the patterns in this collection. I especially love the Christmas Dinner patterned paper. It's my favorite! I love these pictures of Edward building a snowman last winter. He has the funniest expressions. I used the Frosty digital cut file from Just Nick's Studio. This month, we are hosting a 12 days of cut files for free. Grab Frosty today! To get the HEY FROSTY cut file for free, use the code HEYFREE at checkout. This code is only valid until midnight CST on December 10th, 2016. Marcia here today. I hope you have been enjoying our 12 days of Giveaways here at JustNick Studios. For day 9, Nicole sent me this awesome Holly Background 2 cut file to use. I thought it would be fabulous used as a frame for my layout. I also used Tree Trio 2 and Snowflakes. I cut the snowflakes out from heavy cardstock and used the negative space as a stencil! Here is a closer look. Today’s design – Holly Background 2 - is yours for FREE today only! Just enter code: HOLLYFREE at checkout to get this design for free. This code is only valid until midnight CST on December 9th, 2016. Welcome to Day 8 of the 12 Days of Giveaways. Heather Leopard is here with a couple of gift tags, featuring the Pinecone, which you can download HERE. In addition to the pinecone, which is today's free cut file, I also used the Holiday Sentiments 2 file. I decided to make these similar yet different enough, one being centered with the sentiment cut out and the other a little off center and the sentiment adhered to the top. This code is valid until midnight CST, December 8, 2016. No purchase necessary! This design will be available in the JustNick Store for purchase after the discount code expires. It's Tarrah McLean back with you today! Today is the 5th day of the 12 days of Giveaway here on the Just Nick blog - which is so exciting! Nicole has outdone herself with all the designs for this giveaway and you can keep your eyes on the lookout for some beautiful new and FREE cut files coming up in the next days! The design team have created wonderful projects to showcase each design and for inspiration. I am sharing the layout that I created using the free cut file for today - the Tree Trio 2 cut file. I kept my layout fairly simple for a change and I like how it turned out! I cut the three trees from 3 different patterned papers and placed them framing my photo slightly. By adding some layering pieces like stickers and small embellishments I was able to add some extra interest to my page without completely covering up the tree cut files I created. A large chipboard title was begging to be used I I would have had it for like 8 years I think!!) so I finally got to use it! Today’s design – Tree Trio 2 - is yours for FREE today only! Just enter code: TRIO2FREE at checkout to get this design for free. This code is only valid until midnight CST on December 5th, 2016. Design will be available in the JustNick Store for purchase after the discount code expires.